New York Fashion Week draws to a close today and many of the designers pointed to the current social and political turmoil in the world as an element they could not ignore when coming up with their collections. As Prabal Gurung put it, "fashion and politics can no longer be mutually exclusive". 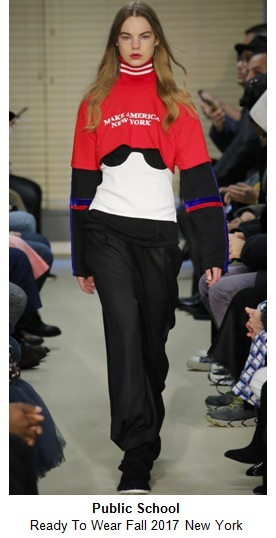 The social statements were included in every facet: from the runway music choices (Raf Simons chose David Bowie's 'This Is Not America' for his Calvin Klein debut), to the staging (Adam Lippes had a pre-show photo session in the street where models in his newest designs held protest signs). 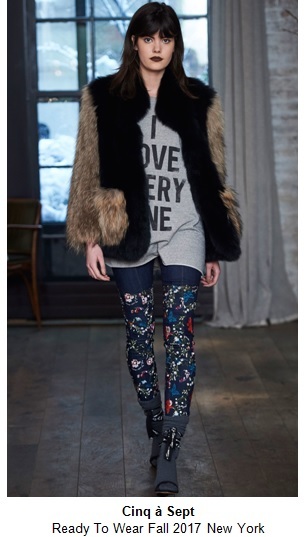 The prevailing trend was definitely tops with slogans that let your clothes speak for themselves. 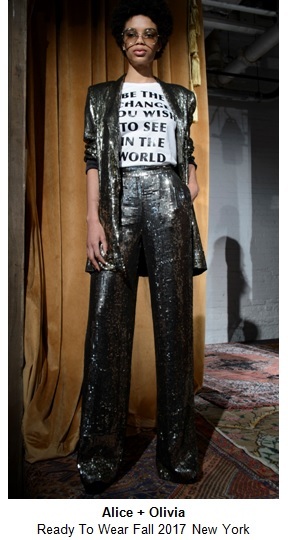 Alice + Olivia's sequin pant suit was topped off with a tee encouraging you to "Be The Change You Wish To See In The World"
Cinq à Sept's muse has an open heart in her "I Love Everyone" shirt. Half of the proceeds from the silkscreeneed "We Are All Human Beings" jumpers at Creatures of Comfort go to the National Immigration Law Center. Prabal Gurung finished his show with a parade of models in slogan tees with statements including "We Will Not Be Silenced", "The Future Is Female" and "Nevertheless She Persisted". Public School rebranded the red cap with a new motto: "Make America New York", nodding to the diversity that the state is known for. 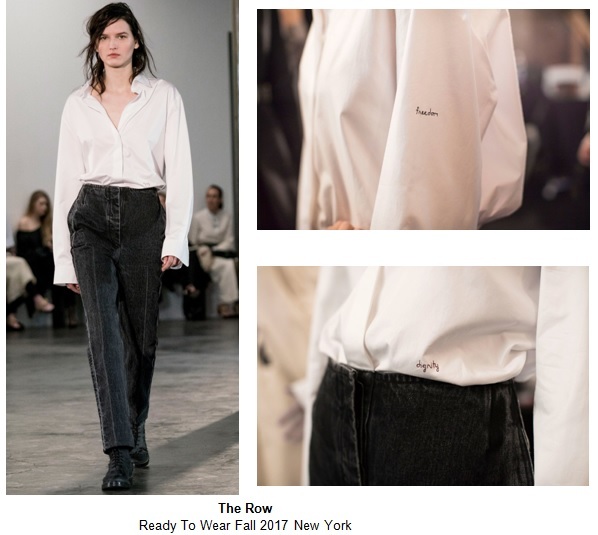 The Row's statement button-downs featured small embroidered words like "Dignity" and "Freedom". Christian Siriano's "People Are People" shirt was inspired by the Depeche Mode song and sold with proceeds going to the American Civil Liberties Union. Dozens of NYFW designers (including Marchesa's Georgina Chapman and Keren Craig, above) wore "Fashion Stands With Planned Parenthood" pins for their final bows. These pins were seen on fashion editors, buyers and it-girls throughout the week as well. The inclusivity and activism theme was heard loud and clear! The styling of these shirts proved that they look great whether topping off a romantic, athletic, casual or glam outfit. Fashion is definitely asserting itself as part of a revolution and empowerment tees are a way to further express yourself through what you wear. New York Fashion Week's message was that not only do we aspire to look good, but we need to do good for the world we all live in too. Will you incorporate the statement tee into your style?